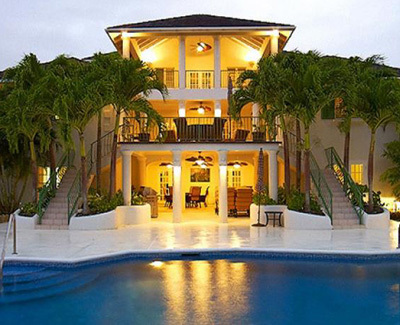 This magnificent 9-bedroom villa in Barbados is located in the exclusive Sandy Lane Estate. Beautiful decor, excellent facilities and fabulous service distinguish Aliseo as an inviting holiday retreat, and its ample accommodations - including formal living and dining rooms - make it an ideal choice for weddings, families or large groups. Each of the 9 spacious bedroom suites is air-conditioned, has a ceiling fan and a walk-in wardrobe. All feature flat screen televisions with satellite TV. The master bedroom is located on the top floor, set apart from all of the other rooms. It features a generous private terrace overlooking the swimming pool, with exquisite views over the grounds and out to the ocean - perfect for warm evenings watching the romantic island sunsets. The lower floor is ideally laid out and equipped for entertaining. There is a further open plan living room with a bar and Karaoke, as well as a games table offering billiards and table tennis. There is also an air-conditioned home theatre and well equipped gym. A small pantry/kitchen completes this area. From the lower level, French doors lead out to a covered terrace area with BBQ and space for alfresco dining, flowing out to the large swimming pool and Jacuzzi. The house is further complemented by a gazebo which commands sweeping views of the entire property and grounds. Aliseo's dedicated, helpful and discreet staff includes a butler, housekeeper, laundress and cook to ensure guests' needs are superbly met. Additional staff is available on request. Guests of Aliseo have access to the Sandy Lane Property Owners' Beach Facility at the nearby Sandy Lane Beach, approximately a 5-minute drive from the villa. The Butler will make all the necessary arrangements for a day at the beach, ensuring your sun loungers are ready and waiting for use.